This is C.P.E. Bach’s year. If you still need convincing that Emanuel was a major composer, one whose writing contains originality, beauty and depth, then spend just a few minutes with the ‘Last sufferings of our Saviour’ (Die Letzten Leiden des Erlösers). One of the first things you’ll notice about the work is the range of emotions evoked. The almost Mozartean Wende Dich [CD.1 tr.10] has a pathos and languor that contrast sharply with some of the more extrovert passages like the almost ‘jaunty’ Verstockte Sünder [CD.1 tr.12] and the upbeat Donn’re nur [CD.1 tr.14 ]. Even after Emanuel left Berlin for Hamburg in 1768, he continued the practice — also his father’s — of composing Passions at Easter based on the Gospel narratives. Die Letzten Leiden des Erlösers is a more concentrated, and shorter, Passion cantata, which was nevertheless designed to be part of a church service. Yet it seems to have had the purpose of more directly stirring the emotions than dourly celebrating the relationship between God and humanity. Piety was not reinforced either by Emanuel’s father’s weightiness; still less by the lightness of the galant style. Rather, by a direct appeal - in places almost operatic - to the heart. C.P.E. aimed to ‘set the heart in motion’. 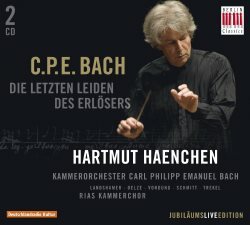 That is precisely what the three female and two male singers do on these two CDs with both the RIAS Kammerchor and Carl Philipp Emanuel Bach Chamber Orchestra very enthusiastically and deftly conducted by specialist Hartmut Haenchen. The singers are neither too forward in attempting to project what the music already conveys by itself; this is actually not opera. Nor are they reticent in bringing out each nuance from Bach’s intricate and finely filigreed lines. They also excel at suggesting and sketching the colour of the textures and the subtleties of some of the rhythmic development - both at climacterics in the story, and at moments which, if not exactly ‘slack’, are there to pull rather than push us along a familiar narrative path. The recitatives, for instance, are almost always more pregnant and telling than were, perhaps, those of his father. Both in solo writing, and during the many times when the tension and/or emotional richness is advanced by ensemble singing these performers are there how they need to be. Soprano, Christina Landshamer is particularly convincing. The acoustic is as focused as it is concentrated; it might in fact have benefited from being a little more expansive but nothing is lost. The booklet in German and English contains useful context and brief bios of the performers as well as the text in German. If exploring C.P.E. Bach for the first time, or getting to know his work in the tercentenary year, this is a good place to start. There is passion, insight and technical brilliance to be heard.